Prototype: Royal Württemberg State Railways (K.W.St.E.) class C express steam locomotive. The locomotive looks as it did in Era I around 1915. Locomotive frame and body constructed of metal. Finely detailed valve gear and rods. Reproduction of brake rigging, rail clearance devices, etc. Model: The model has been improved and is finely detailed. The locomotive body and frame are constructed of metal. It has a reproduction of the brakes, sand pipes, rail clearance devices, etc. on the underside of the locomotive. 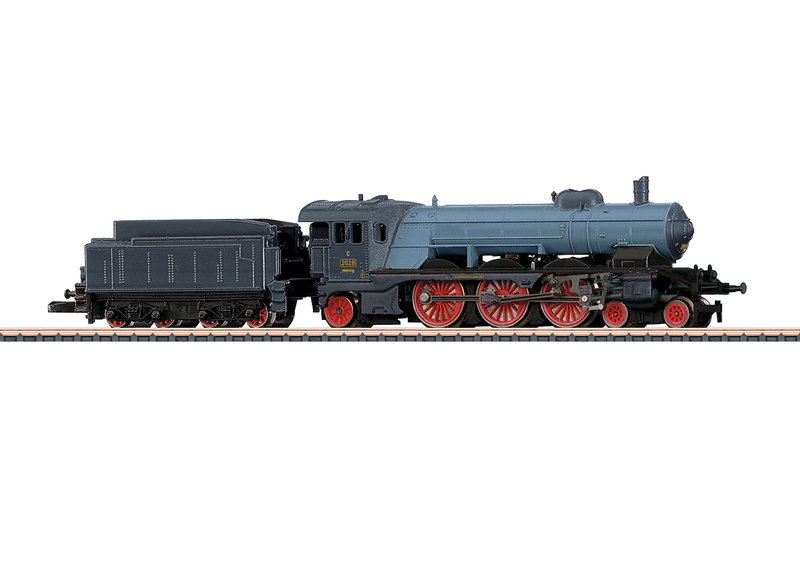 The locomotive also has finely detailed valve gear and rods. There are enlarged buffer plates on the locomotive and tender. The locomotive has a motor with a bell-shaped armature. All 3 coupled axles powered. The locomotive has dual headlights. The tender has spoked wheels. Length over the buffers about 112 mm / 4-3/8".
) Metal frame and locomotive body. g Locomotive with 5-pole motor.